Creativity and beauty are central to the human spirit. A line of poetry, a few notes of a musical score, the aroma of home-made bread, the vivid colours of a sunset, speak to our emotional need for inspiration. We experience this first hand through the lens of our memories, our current reality, and social awareness. It is a personal interaction, specific to our unique perspective that is difficult, even impossible to convey in words to others, even those closest to us. My journey to understand art, has led me to a profound conclusion. When we look at a drawing, sculpture or painting, we are witnessing an artist’s intuition and creative vision. Whether we fully identify with the artwork, is unimportant. Rather, our role is to listen to the unspoken message, which is what I did when I viewed “Fine Wind, Clear Morning” by Katsushika Hokusai. I identify with Katsushika Hokusai. When I look out my window at the North Shore Mountains overlooking Vancouver, I am touched by their exquisite splendour. And yet, there is a deeper resonance, one that crosses time and space. It is a universal recognition that humanity belongs to our world of blues skies, brown earth, seasonal changes and time limitations. May we cherish and protect our blue skies! This is great. Thanks. Thank you for your heartwarming thoughts. A wonderful way to welcome 2018!! Looking forward to our ongoing conversation. 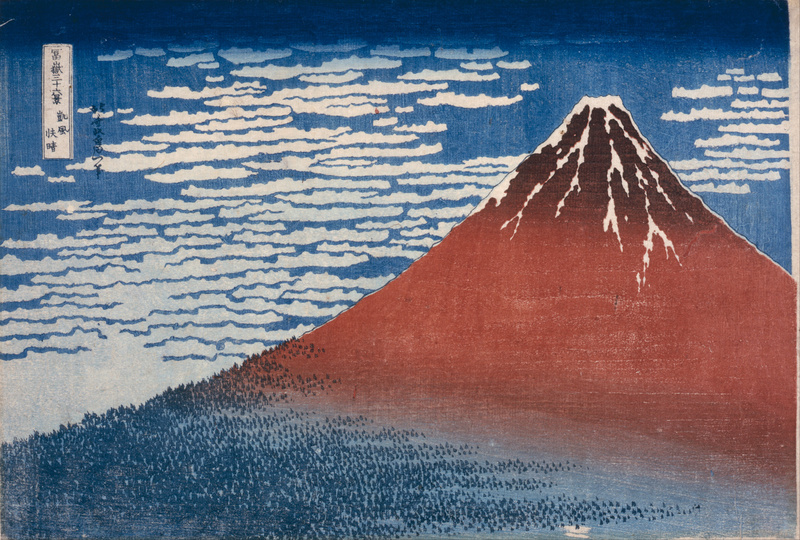 “Thirty-Six Views of Mount Fuji.” is probably not enough to express the majestic beauty of this peak. Katsushika Hokusai seems to have known what he was doing. He certainly does, Resa! Have you noticed how we are connected through the centuries by artistic endeavour which is seen in our poetry, music, art. Humanity strives to reach the next level and in so doing, inspires those who follow. One generation gives to the next. I find that comforting as well as a caveat to participate – we do not live only for our time, but for all times. Thank you!! You always make my day. We are on a grand adventure, are we not, Christy? Our ability to connect with the past is based on the artistic endeavours that have been left by those who went before us. Their legacy prompts us to follow their lead. Whatever we create, whether in words, deeds, music, dance or art, will define our generation. May we remember that what we accomplish is not only for our personal enjoyment; rather, it is our contribution to the narrative of humanity. I love that you connected the art with your own view (framed in a way by your window) of the North Shore Mountains. To live out loud…. what a powerful phrase. I love that! ‘My journey to understand art, has led me to a profound conclusion. When we look at a drawing, sculpture or painting, we are witnessing an artist’s intuition and creative vision. Whether we fully identify with the artwork, is unimportant.’ I don’t fully identify with these art works but I find them extraordinary…..https://www.canterburymuseum.com/whats-on/perseverance-japanese-tattoo-tradition-in-a-modern-world/ And to think the Edo period still affects our sensibilities! I agree. It is remarkable that we continue to be influenced by Japanese art and literature. I am glad that we live in a global community that allows us to explore and celebrate many forms of artistic endeavour. “Fine Wind, Clear Morning” prompted me to look at the different forms of Japanese poetry. Tanka, Renga, Renku, and Uta-awase and Haiku. I feel I’m going down a marvelous rabbit hole, that leads from one idea to another and another and another. Thank you so much for the link – you always find the more interesting stories. Many hugs!!! It’s a bit like looking in a mirror and not really seeing what other people see… we are grateful to people like you – and like lovely Mishelle, who take the time to tell us what it’s like to view art. You help keep us productive and energized. Thank you!